Made by moms, grandmas and chefs the world over, soup is often dished up to fend off colds, flus, the side effects of surgery and any number of illnesses. Is there a scientific explanation for it? Not precisely. 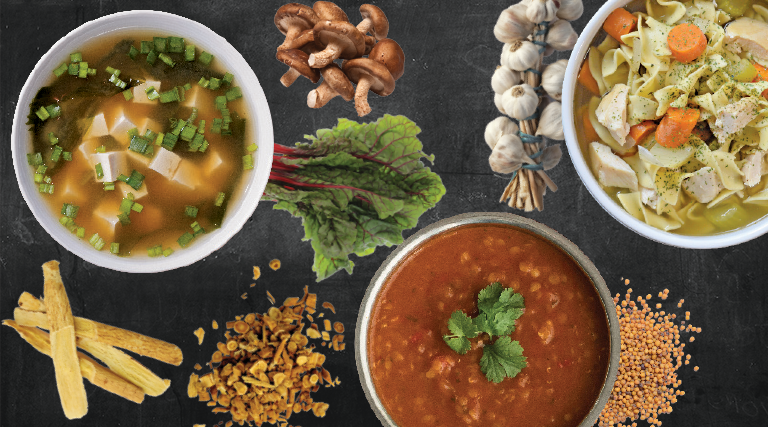 With soup’s myriad ingredients and cooking methods, it’s difficult to isolate and test the beneficial ingredients as a controlled experiment. However, one study from the early 2000s published in the medical journal, Chest, did suggest that chicken soup has anti-inflammatory effects that help reduce upper respiratory cold symptoms. The question is, if you’re under the weather, do you need proof? As long as soup tastes delicious, warm and comforting, it’s good medicine, right? In truth, soup provides superior nourishment and healthy benefits to the body. Soup’s colorful vegetables are packed with phytonutrients like vitamins C and K, magnesium, potassium, iodine and fiber—all of which feed the blood and support proper organ function. In addition, soup ingredients can help balance the body’s pH (today’s modern diets are thought to increase acidity in our bodies; it’s considered healthier to be at a slightly alkaline level). Balancing our pH helps prevent cellular damage and controls inflammation. Bone broth provides extra minerals, collagen (good for bones and tissue), gelatin and glucosamine as well as additional anti-inflammatory amino acids. A soup with wild-caught fish supplies essential omega-3 fatty acids. To promote wellness and improve energy, consider adding herbs and ingredients with therapeutic value. Traditional Chinese Medicine (TCM) has long prescribed specific recipes using herbs and animal parts to cure illness and enhance longevity. A basic concept in TCM is to bring the wei qi or body energies (yin and yang) into balance. Practitioners search for excess cold or heat in the body and use herbs to put them right. Examples: ginger and cayenne are warming, dandelion and burdock are cooling. Herbal-soup packages for all sort of ailments are available at many Asian markets, including many along the Wasatch Front. During the change of seasons, some herbalists use the astragalus root as an immune booster and tonic. The root is simmered with shiitake mushrooms, high-mineral kombu seaweed, garlic, dark leafy greens like kale or chard and tofu for protein. To experience the benefits, follow the Astragalus Miso Soup recipe at TraditionalMedicinals.com. Ayurveda is another ancient healing tradition from southern Asia. The practice looks at the doshas—mind-body types, based on physical, emotional and mental characteristics. Practitioners determine the patient’s dosha (Vata, Pitta and Kapha) and looks at excesses and deficiencies such as cold and heat or dryness and moisture. Like TCM, plant-based Ayurvedic treatments may be derived from roots, leaves, fruits, bark or seeds. Red Lentil Soup is an Ayurvedic recipe that is tridoshic—serving all three doshas. Cooked with cumin, mustard, garlic, turmeric and masala, the cooling and drying aspects might help with gut disturbances and the spices are detoxifying to the liver—especially turmeric which is also anti-inflammatory (see soup recipe at Ayurveda.com). If you find these old (yet sophisticated) traditions and ingredients too unusual to make use of right now, fall back on what you know. Chicken soup is universally known to be good for a cold. Why? Because the warmth stimulates secretions to help clear airways and causes perspiration, which is detoxifying. It might even inhibit neutrophils, the white blood cells that eat bacteria and cause inflammation and mucus. The lean protein of the chicken along with tender, nourishing veggies are easy to digest, which is desirable when someone has little appetite or is on the mend. In addition, chicken soup is usually made and served with love and care. Other common ingredients can be helpful to your well-being. Cabbage can help fight infection. Okra is demulcent, soothing to the digestive tract. Shiitake mushrooms support immunity, and garlic is antimicrobial, plus it gets excreted through the lungs and skin, so it’s good for clearing congestion. Beets have anti-anemic benefits because they are rich in iron and copper and have a hepatorenal detoxifying effect. To chase away a chill, use onions, garlic, kale, spinach, yams, squash, turnips, quinoa and parsley (when cooking veggies, simmer, rather than boil, to retain optimal nutrition). Even beans and grains have particular health advantages. Herbs and spices are essential for boosting therapeutic value. Fennel, cardamom, cumin, celery, fenugreek, turmeric, dill, parsley, turmeric and others have a carminative, stomach-soothing property, but herbs seldom have only one benefit. For example, oregano is antibacterial, antifungal, cholerectic, carminative, anti-inflammatory, antioxidant and diuretic. Turmeric is anti-inflammatory as well as liver protective, cholesterol reducing, antiviral and antitumoral. Herbs have restorative properties that are especially important after an illness when one’s vitality is sorely depleted. Mineral-rich herbs like nettle, dandelion, sorrel, celery and parsley in broth are easy to digest. They feed and purify the blood and help improve energy. To understand how to better utilize herbs for any health condition, visit an herbalist and learn which ones might be useful for your symptoms. Herbalist Merry Lycett Harrison owns SLC-based Millcreek Herbs. In addition to offering classes in medicinal herbs, culinary herbs and herb gardening, she leads herb trips in the wild. To learn more, visit MillcreekHerbs.com.